Posted 9 July 2014 under Ask Us. It’s true that some people only have asthma as a child and never seem to have symptoms again. Others can have symptoms their whole lives. Finally, there are other people who have no symptoms for years and then have it bother them again, many years later. It’s important to remember that asthma is a chronic condition, unlike a common cold, which is temporary. 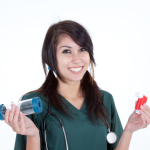 As a teen with asthma, you will probably have it as you grow into adulthood.